One of the things I enjoy most about covering Charlotte in my work as a freelance writer is the fact that I'm always learning something new and interesting, which I then try to convey to the reader. And, oftentimes, I learn more about something that I'd previously encountered. 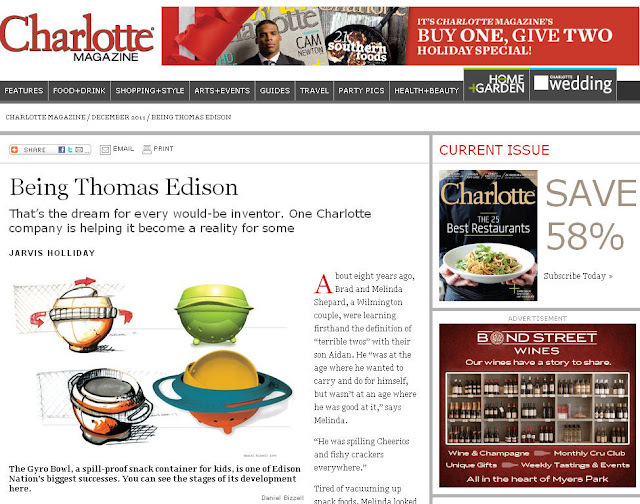 That's the case with Edison Nation, a Charlotte-based idea-to-shelf product development company I profiled in the December issue of Charlotte magazine: "Being Thomas Edison." I wasn't aware of Edison Nation until earlier this year. I'd been familiar with its parent company, Enventys, and had actually visited Enventys' office in 2007 for the premiere party they held for the launch of Everyday Edisons TV show (Enventys, Edison Nation, Everyday Edisons, and Inventors Digest magazine are all now housed in that building on the edge of Uptown). You should definitely read my Charlotte magazine article (if you haven't already; the December issue has been on newsstands for about three weeks now) to see how Edison Nation was spawned, largely from the TV show, and how the company has helped inventors as well as ordinary people with good ideas get their ideas patented and developed into products you might have seen in stores or perhaps even own. Eggies, Emery Cat, Gyro Bowl, Mister Steamy, and Total Wrench, to name a few. One of the reasons Edison Nation has become so successful is that it has created an online community for inventors, idea people, and entrepreneurs. EdisonNation.com members (it's free to join) from around the country communicate with each other daily in forums on the website. The staff at Edison Nation also fosters interaction through social media sites and, in fact, is hosting a tweet chat this Tuesday, December 13 at 8 p.m. It'll be an hour-long, live chat session on Twitter to discuss important topics in the world of invention. You're invited to "Come ask and answer questions, meet new people, share resources or simply hang out with idea people just like you!" The hashtag for the Tuesday night session is #InventChat. 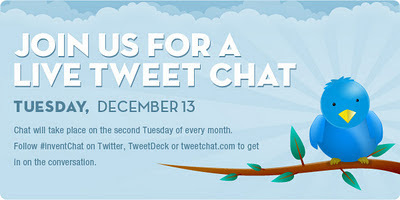 Edison Nation plans to hold these tweet chats every second Tuesday of the month. Also, to further illustrate how its idea-to-shelf process works, the company put out this video last week: Learn How Edison Nation Works!